Our Christmas preparations are well underway. Our tree arrived this week. 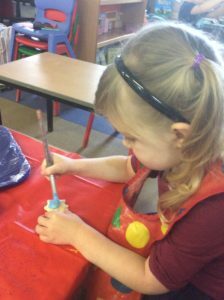 The children had great fun decorating it. 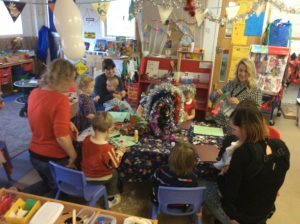 The fair last Saturday went really well and we raised £289 between both nurseries. Thank you for all your help. We still have a few bits and pieces for sale if you would like to purchase something. Everything is either £1 or 2 for £1, all proceeds go to nursery funds! Sparkle and shine was a great success. Thank you to all who attended. 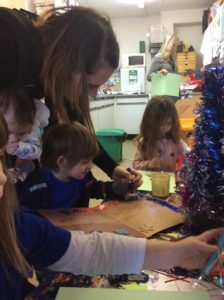 The boys and girls had a great time getting into the festive spirit making cards and singing along to Christmas music. 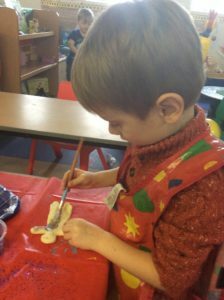 The boys and girls have been very busy practising for their Christmas show on the 14th and are doing so well. Please make sure you have filled out the online form to receive your tickets for the show. The allocation is 4 per family. We have lots of other exciting dates coming up for your diary. Christmas jumper day is on the 12th and we are really looking forward to our trip to the fairy woods on the 17th. It will be a great day out. Please make sure you have returned the permission slip that was sent with the email so that we can ensure we have the correct numbers. Finally we will end the celebrations with our Christmas party on the 20th. We look forward to dancing and party games before we all break off for the holiday’s. We hope you all have a wonderful Christmas.